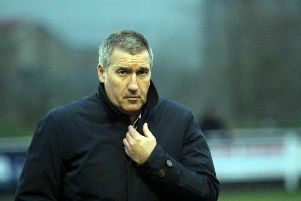 Banbury United boss Mike Ford was delighted to see his side make it back-to-back home wins. Saturday’s Evo-Stik Southern League success over St Ives Town means United have extended their unbeaten run in 2018 at the Banbury Plant Hire Community Stadium, much to Ford’s delight. Ford said: “We’ve worked really hard to try and make sure our home form is better, in training and on match days. We’ve beaten two sides which we should do really but we’ve not done that enough this season. “We’ve gone away earlier in the season and won, come back here and expected to win but have been a bit too loose in our play. I’m now playing an extra midfielder instead of two up front to try to make sure we don’t get outnumbered. “I feel we can bridge the gap, we did it in my first season and nearly did it last season by making the play-offs with good football. Ford’s planning for Saturday’s game was hampered when he found out Jack Harding was still carrying an injury. With on-loan Queens Park Rangers keeper Martin Herdman also out injured, Ford has no time to bring in another keeper on-loan once Thursday’s deadline day had passed. Ford said: “Jack Harding did the warm-up and looked okay in the first half but he felt his knee when he went to clear the ball in the second half. Fortunately, he didn’t have a lot to do.